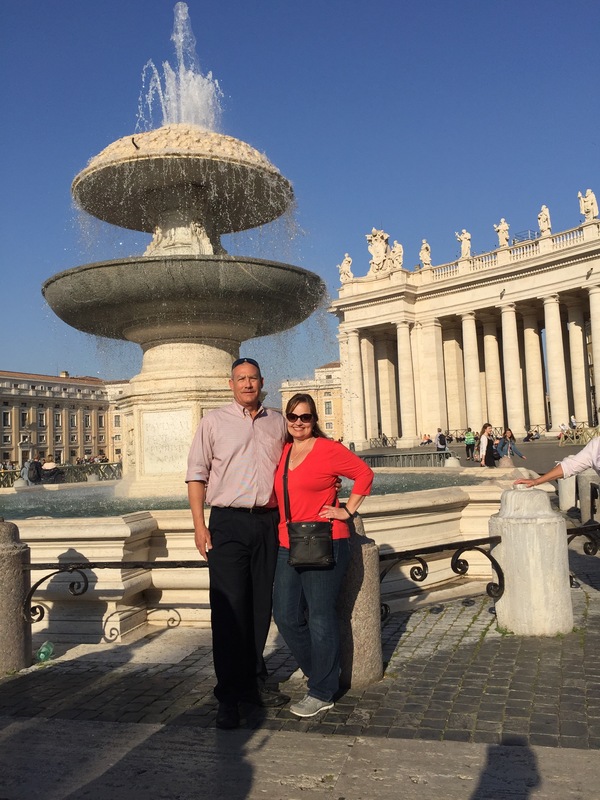 Shopping and cappuccino with two other wives in the morning, then The Vatican with Terry in the afternoon. Though we are not Catholic, it is a beautiful experience. There are countless rooms in the museum (and apparently an entire Egyptian wing we never saw signs for) and you spend 2+ hours walking through them before finally getting to the Sistine Chapel. To be perfectly honest, it was so very crowded that it was difficult to truly appreciate it as it deserves. Our favorite part may well have been visiting the Vatican Grottoes. There were very few people, plus it was interesting to see the carvings on the tombs. Now for the bad news. Today I wore my hair partially up with three bobby pins holding it in place. I lost a bobby pin. Don’t you hate when that happens?! No signs that it’s going to turn up. Not to be outdone, Terry lost his wallet just outside the Vatican. It held: too much cash to carry around Rome (shame on him), a debit card and credit card, his CA driver’s license, and the park and fly car receipt. It’s even more frustrating that he laid it down on a counter to purchase postage stamps and forgot it…so it was clearly picked up and kept. International calls from the cell (ugh) for some 20 minutes got his cards cancelled. A police report exists in case it gets turned in and I have a “lost” ad on Craigslist just for fun. The police sternly warned him, “You must pay intentional.” He will pay intentional from now on. This evening while I was pouting (ok bawling) in the room because I am fed up with people keeping things that aren’t theirs, Terry caught a glimpse of the news to discover the Vatican had a terrorist threat today. That explains the increased security we noticed, as well as the heavily armed guards around the American Embassy. I think it’s time to go to bed, counting my blessings and ending my pity party. 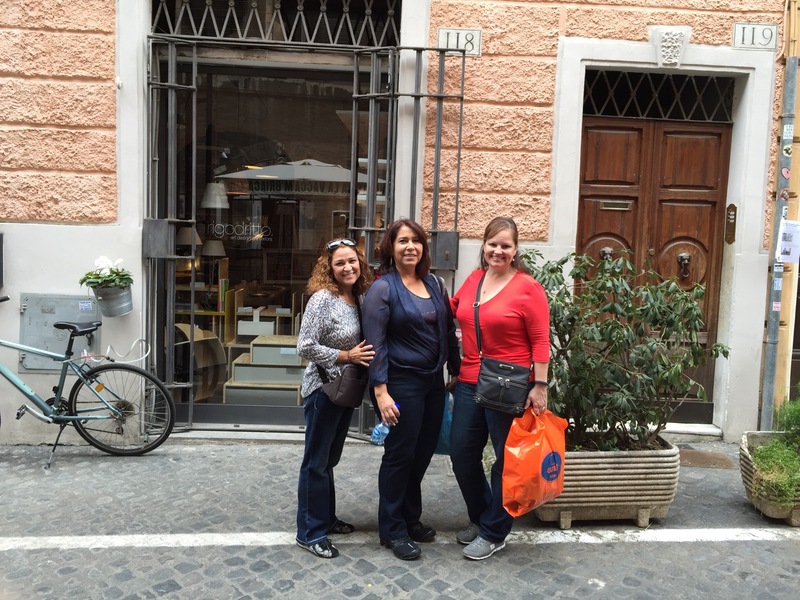 “The wives” – patiently hung out with the engineers and such all week, but rewarded ourselves with cappuccinos and shopping today. Oh, and chocolate. 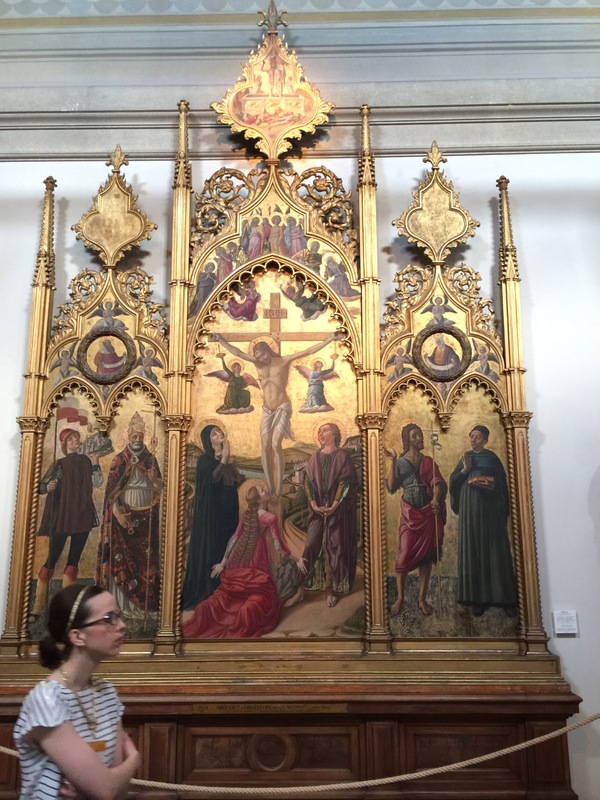 One of many Crucifix pieces of art. And the best timing I could get where only one person walked in front of me. 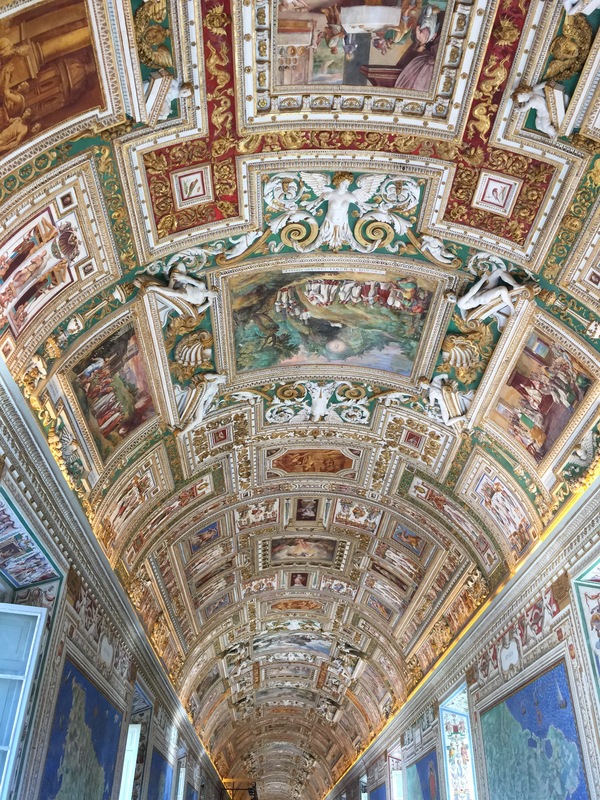 🙂 A ceiling in The Vatican. There are so many lovely pieces of art, but the crowds are so thick that it takes patience to wait to observe a piece. This would be about 10 minutes before “the missing wallet discovery.” At this point, Terry is down $300 but doesn’t even know it yet (as witnessed by his half smile and my full smile). Things turned south and there was no more smiling for awhile. Me? I kept my purse on me at all times, and when we were near crowds, my hand stayed on my closed zipper. Really SO sorry for your loss. I am sure you will utilize a money belt in the future for all but your daily cash…:-( One can easily be distracted and make mistakes more often when traveling than just being at home. Huge disappointment, but “things” can be replaced. Loving you by keeping it real!!! Tomorrow will be a better day for sure. Forget the wallet. You lost a bobby pin? It is practically an accessory!! :). Did you tell security about YOUR loss?? One day, when we all get ‘home,’ you can lay your valuables anywhere and they will be completely safe. Don’t expect to much from this world. FATWOAF.